TEKELI-LI!! It’s the thrilling conclusion of At the Mountains of Madness! We’ll be back in two weeks with readings by cool cats Rachel Lackey and Heather Klinke, and then the week after that we’re gonna splash into some summer madness with The Shadow Over Innsmouth. I.N.J. Culbard for being a special guest – get his graphic novel adaptation here in the U.S. and here in the U.K.! The H.P. Lovecraft Historical Society for their patronage – you can pick up their radio drama adaptation here! Reber Clark for his fantastic soundtrack, available for sale now! Joe Fria for dropping some scary-great readings! Have a great 4th of July everybody – see you in two weeks! Wow, guys! Makes the slog through 82 weeks kind’a worth it, huh? A great production guys. I’m looking forward to the readings and your coverage of The Shadow Over Innesmouth. Excellent show. I think you’ve ended your run on ATMOM with the perfect podcast: lots of hilarious goofing around mixed in with plenty of serious debate. Great guest, great reader, great music. Your best since The Call of Cthulhu, in my view. I’ve already booked my motor coach ticket to Innsmouth – can’t wait! Maybe “tekeli-li” is something like “What’s going on”. Which makes the fatal mockery even more vicious. And in Del Toro’s script, that bit at the end, that Danforth saw, reveals Cthulhu getting loose. Hey Guys, great show! One thing I should clear up: There wasn’t another Elder Thing, it was a case of mistaken identity. They didn’t know until they found the Bodies that the Shoggoths were in charge, so it didn’t cross their minds in the ensuing din and chaos that the Shoggoths had adopted the Elder Thing language. Thanks guys. Indeed, this ritual was beyond time and space. 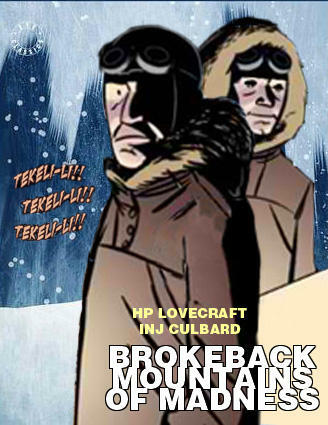 And thanks too, for all the information connected with the ever evolving creative universe of H. P. Lovecraft: movies, graphic novels, etc. Please, try to enlarge a little more upon the writers you quote; for they had their dark part in the blessed birth of the Myth. Yeah, I came in here to say exactly what Grandpa Theobald said. There was no other Elder Thing fleeing out of the tunnels with them. It was just the shoggoth all along. Awesome job with At the Mountains of Madness guys! Looking forward to The Shadow Over Innsmouth!!! I can’t wait! Outstanding job on Mountains of Madness, guys! Really top notch podcasting. I’ve read ATMOM several times over the span of many years, but your show really enhanced my enjoyment and appreciation of the book. I’m looking forward to Innsmouth. I re-read it late last year in the Necronomicon Press Annotated and Illustrated edition edited by Joshi & Schultz, an edition I highly recommend! It has really good notes. I just happen to be listening to The Narrative of A. Gordon Pym by Edger Allen Poe. In Chapter 22, the characters have encountered savages in Antarctica. The savages cry Tekeli-li! One of the things I like about this particular story is that it shows just how deep the horror goes in Lovecraft’s world. The humans are freaked out by the Elder Things, the Elder Things are freaked out by the shoggoths, and even the shoggoths are freaked out by the thing beyond the even higher mountains. I don’t think this could have been made into a movie, or at least not without forcing it into the Hollywood formula. Just want to say I love this podcast and have been going through the older episodes, working my way toward the newer ones, but when I saw there was a 7 part ATMOM discussion coming up, I skipped ahead to check it out. I was not disappointed. It’s funny you guys forbid reading this story first, because it’s actually the first thing by Lovecraft I ever read, and it’s what got me hooked on the rest of his writing. Looking forward to many more excellent podcast episodes! Hi guys, I recently discovered this wonderful podcast, and have been listening to it almost daily. I am surprised that my interpretation of what Danforth saw was so far off from what you interpreted. I always thought that Danforth saw another huge mountain, and that the mountain was, in fact, a giant-frozen shoggoth (hyphenation for the win! ).